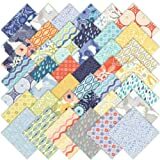 This fabric set includes 42 5-inch (12.7cm) die cut fabric squares from the Celebration Boy and Girl colorways by Bunny Hill Designs for Moda Fabrics. This set includes duplicates. 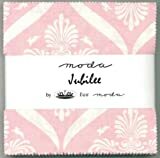 Introducing Jubilee by Bunny Hill Designs for Moda Fabrics. 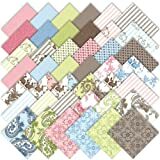 Take an elegant damask, surround it with little running bunnies, and offer it in seven beautiful color combinations — that’s the foundation of Jubilee! The colors are bright and the prints are classic. It’s a Jubilee of colors and prints! 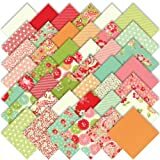 Set includes 38 5″ (12.7cm) precut fabric squares; 2 each of 19 different prints. Content: 100% cotton. 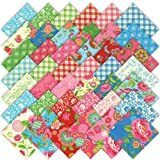 Quilt & fashion weight. Professionally cut and packaged by RJR Fabrics. 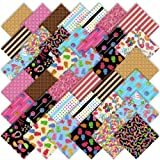 Get the scoop on your favorite sweet treats with The Sweet Scoop by Dan Morris for RJR Fabrics! 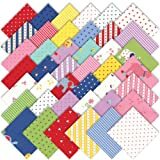 Set includes 42 5″ (12.7cm) precut fabric squares. Some duplicates are included. Remember when you were young and could spend your afternoon weaving a daisy chain or lying in tall grass dreaming of summer romance? Gypsy Girl is inspired by carefree summer days. 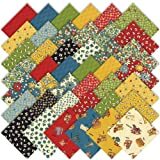 Bright and cheerful colors blend together with a warm and youthful charm. With a modern twist, Gypsy Girl will add youthful vibrance to any project. Enjoy! What looks old is new again with these vintage prints and fresh colors. 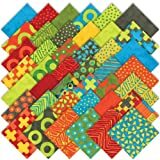 Simple shapes, squares, rectangles and triangles are as easy as 123. Have fun making a new start on a new day.